Once you have established a strong Watch group, it is important to start building skills needed to make your group a success. While NW exists for more than just crime prevention, it is important to build the skills necessary for preventing crime as well as terrorist activity, and preparedness for natural/man-made disasters. Schedule training sessions with your law enforcement liaison or other law enforcement agencies that might have training courses. The National Sheriffs’ Association offers skill building training through the Neighborhood Watch Toolkit. Your local law enforcement may already have a Toolkit you can borrow for your meetings. Also look for other resources such as your state Crime Prevention Association or the National Crime Prevention Council who may hold training in your area. Most people go through the day without even noticing everyday events. However beginning to recognize what is normal around you is the first step in recognizing what is not normal. Although law enforcement officers are trained observers, sometimes they find it difficult to explain to citizens what to report and when to report it. While patrolling the streets, officers get used to looking for activities or events that seem out of place or are not part of the regular or ordinary routine. Officers may not be able to articulate specifically what is unusual, but they are keenly aware that something is awry. Officers sometimes refer to this phenomenon as a “sixth sense” or “street smarts,” and they instinctively know when something is not right and they should investigate. Community members should know they have the ability to recognize unusual events as well. It is a matter of practicing Observation Skills to make them stronger. 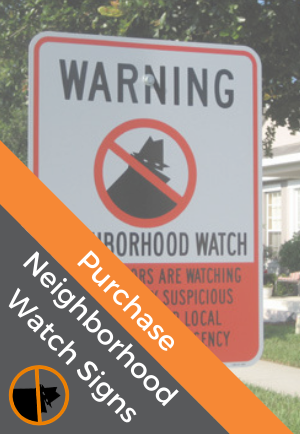 One of the keys to a successful Neighborhood Watch program is recognizing the importance of using good observation skills to keep your neighborhood safe. Practice looking at pictures of people to know how to describe them. Clothing is important, but look for things that cannot be changed, like skin or eye color, tattoos, scars, moles, height and weight. Properly observing vehicles is similar to observing individuals. You always begin with the basics, such as the make and model of the vehicle. Identify the vehicle as a Ford, Chevrolet, Dodge, Honda, Mercedes, Volvo, etc. Then identify the both the type of vehicle (such an SUV, pickup truck, etc. ), as well as the specific model if possible (such as Corolla, Accord, Expedition, etc.) To remember license plates: write it on paper, on your hand, or even scratch it in the dirt! License numbers are useful only if they are correct. Never hesitate to say, “I’m not sure”. With a vehicle description, even a partial license plate can be valuable. All too often citizens are confused about what they should report and why, so it is important to train citizens through a variety of reporting activities. After reviewing this section, participants will be able to advise citizens specifically on the appropriate who, what, when, where, and how of reporting. Often citizens ask officers “Why should I get involved?” or “How am I going to benefit by reporting suspicious activity?” Although the answers may seem obvious, it must be clearly communicated to the public that they are an essential component in protecting our communities. Sometimes our citizens receive mixed signals regarding what to report and when to report it. Other times they simply do not know what is expected of them. It is important to learn specific definitions and details to provide Watch volunteers with clear and concise information. 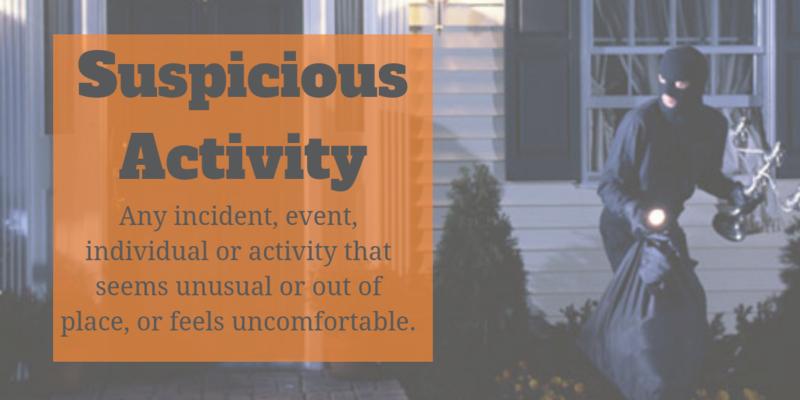 Begin with defining “suspicious activity.” Officers should know the definition of suspicious activity and be able to properly communicate this definition to Watch members and other concerned citizens. Suspicious activity can refer to any incident, event, individual or activity that seems unusual or out of place. Unusual events or incidents,dangerous situations. Dial 9-1-1 and call the police department or sheriff’s office. Tell the call taker what happened and the exact location. Provide a detailed description of individuals or vehicles. Remain on the phone and stay calm. Be prepared to answer follow-up questions. When to Call 911 and When Not To. Calling 911 is an important communications tool for emergencies. However, some citizens call 911 in non-emergency situations. This can cause the dispatch operator miss a call of a person needing help. It is important that not only your groups but all citizens understand when to call and when not to call 911.